Thunderbird 52.8.0 is a new version of the popular cross-platform email client that fixes several security vulnerabilities in the email client. Existing Thunderbird users can run a check for updates from within the client; to do that, tap on the Alt-key on the keyboard and select Help > About Thunderbird. The update check should pick up the new version 52.8.0 so that it is downloaded to the local system and installed. 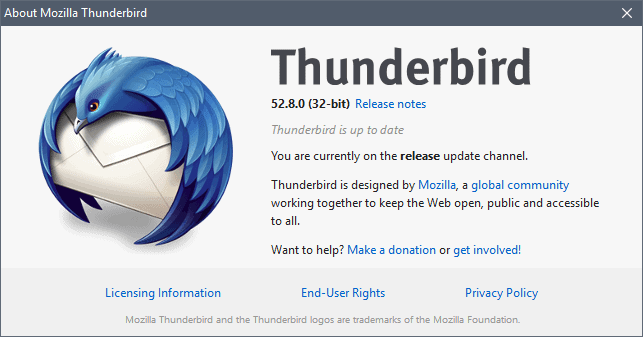 Thunderbird 52.8.0 is available as a standalone download from the official project website as well. You may use the installer to upgrade existing installations of the email client or install it anew on a supported system. The release notes highlight changes and issues. Thunderbird 52.8.0 is a security update for the email client that fixes several security issues. Several security issues received the highest impact rating of critical. Thunderbird 52.8.0 protects emails against some exploits of EFAIL, a recently disclosed attack against OpenPGP and S/Mime. Attackers may use EFAIL attacks to retrieve the actual text of encrypted messages provided that they managed to get hold of the encrypted email and that the target runs a vulnerable client. The team plans to publish Thunderbird 52.8.1 to fix the issue completely in Thunderbird. Check out the descriptions for the vulnerabilities CVE-2018-5184 and CVE-2018-5162 for additional details. Thunderbird 52.8.0 is a security update for the email client that addresses two critical security issues and several rated as high. Thunderbird users should consider upgrading the client to the new version as soon as possible. Those who use OpenPGP or S/Mime should install the patch asap; it is still recommended to block remote content in Thunderbird to block attacks. Now You: Which email software do you run? Thanks a lot for the heads-up and the tips regarding the security settings! Thanks for the reminder. Now Thunderbird is uptodate. When the 60 will be released, and what about the 64 bits ? I never cared for Thunderbird past the 2x releases. I love it back then. But the new indexing in v3 and beyond seemed to slow things down. Maybe I should give ‘er another chance after all of these years. Just updated to 52.8.0 , but now I keep getting notices that I have new messages but they are not visible unless I go into Folder Properties and follow prompts to repair the folder. What’s up? How can I stop this? It wasn’t like this before the update.